55 engineering students from the Technical University of Kenya (TUK) failed to graduate in the University of Nairobi (UoN) September 14 graduation, after the two university technically refused to comply with a court order. The students were supposed to graduate last year according to a court order issued by Justice Chacha Mwita, but TUK leadership frustrated their efforts to graduate by refusing to forward their names to UoN. TUK, formerly Kenya Polytechnic, was a constituent college of UoN, before getting a chatter from the government in 2013. The 55 joined the University College (TUK) in 2009 to pursue a degree in Bachelor of Engineering in Electrical and Electronic Engineering. The university college was at the time a constituent college of the UoN. When the university college received a charter the students continued with studies in TUK up to completion. They graduated from the TUK, and were awarded its degrees. Since the ministry of Education did not recognise engineering courses offered by TUK, the students applied to UoN for registration as graduate Engineers, but their applications were declined on grounds that TUK had not been accredited to offer Engineering courses. 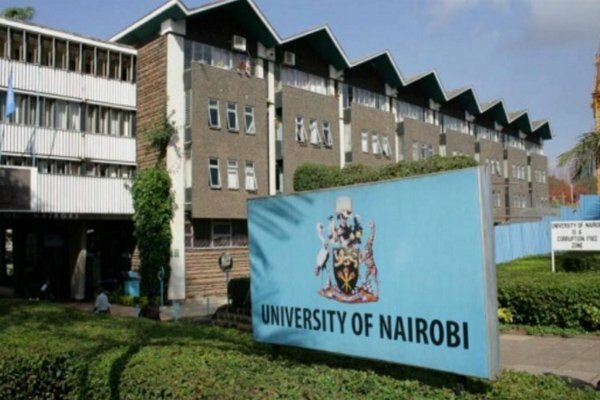 According to Section 5 of the University of Nairobi Act, 210 B on conferment of degrees and other academic certificates, the degrees to be awarded by the University College shall be the degrees conferred by the University. This means that the 55 should have been awarded with degree certificates from UoN but not TUK, as is the case. “When the petitioners commenced their studies in the university college they were by law entitled, upon completion of studies to degrees of the 3rd respondent (UoN). The university college had no legal power to award its own degrees,” ruled Justice Mwita. Justice Mwita also ruled that the petitioners and the other 55 were valid students of the University of Nairobi having been enrolled at Kenya Polytechnic University college which was a Constituent College of University of Nairobi. “An order is hereby issued nullifying degree certificates issued by the 2nd respondent (TUK) to the petitioners (students) on December 18, 2013. 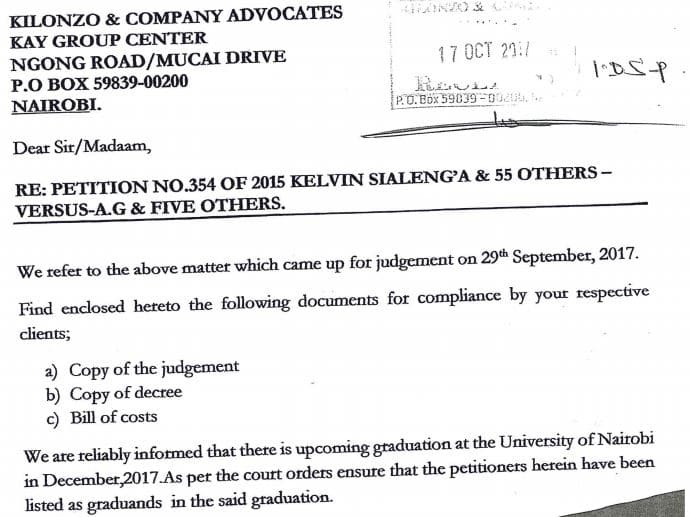 “An order is hereby issued compelling and directing the 2nd respondent (TUK) to forward with immediate effect the names of the petitioners and the other 55 to the 3rd respondent (UoN) for inclusion in the 3rd respondent’s (UoN) list of graduands for the next graduation to be held,” ordered Mwita. However, the two universities have failed to comply with the order, a year since it was issued as the students stare on a bleak future of their professions.